As your weight loss coach, I first want to know why you are overweight. The key to losing fat permanently starts with understanding how YOU became fat and why. Losing weight is very challenging and requires an aggressive and comprehensive program and a lot of support. 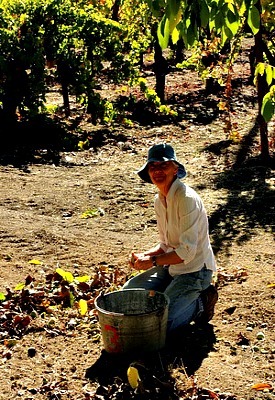 Hi, I'm Jan and I am a Longevity certified weight management adviser (and walnut and grape grower.) In order for you to live a thinner, healthier life, it's essential for you to be committed to changing your lifestyle. There are lots of tools and information that will enable you to make these changes. This is a multi-modality approach that covers all the bases in making sure you lose the fat permanently, not a diet that you jump on and off, losing weight and then gaining it back! It's so important to have science based, nutritional knowledge on how you can lose fat forever. You CAN be helped even if you have failed over and over again. Temporary diets do not work as you are probably well aware. I've been as frustrated as you are now about diets, food and eating. I love food and I love to cook AND I'm a chocoholic. When I was fat and cycling on and off diets and really terrible fasts I could think of nothing BUT food. The crazy making stopped for me when I learned how to restore my metabolic balance, change my thinking and eat for my health. What do you get when you do a consultation with me? hour telephone consultation and analysis of why you're not losing and what intervention is required. A written report and a very specific plan for reaching your weight goals in stages. Three months of coaching during which time you will make the necessary changes to LIVE at your goal weight. I will call you once a week for 3 months for a 20 minute review of the 3 new habits you are working on. We will review your plan and your progress at the end of the 3 months. You need to be consistently losing fat by this time. You will check in on a regular basis by email until you reach your ideal goal weight. What you learn may surprise you! You are undoubtedly contributing to the belly fat in ways you didn't suspect. What is really causing your plateau, how can you burn fat efficiently, how to eat to increase your metabolism? Hormonal and metabolic issues may be complicated but they can be resolved in a healthy way. * Please note this telephone consultation is only offered in the United States. This is a healthy home weight loss plan. When you hire me to be your weight loss coach, I will schedule an appointment with you for a telephone consultation in the comfort of your home. A study in the New England Journal of Medicine published in November 2011 demonstrated that remote weight loss programs are as effective as in person coaching. We will do our consultation on the telephone making it completely convenient for you. Do you have insulin resistance or type 2 diabetes? Are you genetically predisposed to your weight gain or to obesity? What has your diet been like over many years? How many years have you been overweight and what's behind it? Being fat as you know can lead to serious health problems like heart disease, type 2 diabetes, stroke, osteoarthritis, even cancer. An incredible two thirds of the American population is now overweight and one third is obese. These are the biggest challenges to safe, permanent fat loss. They are NOT insurmountable. You CAN be a healthy weight and fit into nice clothes and have a happier more productive life no matter how many diets have failed you! *If you have developed any serious medical complications due to your excess weight, you must consult with a doctor and get medical advice. Using a weight loss coach does not take the place of medical care. Consult with your doctor before starting any new weight loss program. Fill out this simple survey and you will be on your way to a healthy, slim body with all the support you need to get there. Change your thinking and you will change your life and lose fat for a lifetime! Nine ways to de-stress and create new, healthy habits. How to develop will power with your own behavior plan plus a simple technique that you can try for FREE and break free of emotional eating. Fill out this form to get your Free EFT session with a certified instructor. Return from Weight Loss Coach to Lifetime Fat Loss home page.